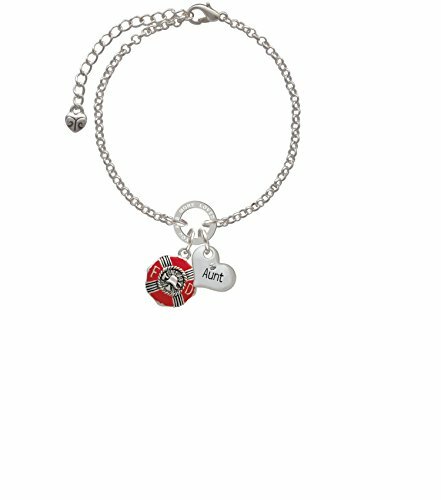 Silvertone Red Enamel Fire Department Medallion Aunt Heart with clear crystal You Are More Loved Than You Will Ever Know Circle Bracelet. Silvertone, hand enameled charms. Charm size is approx. 0.71 x 0.6 x 0.15 inches (HxWxD) including loop. Bracelet is adjustable from 6.5 to 8 inches. Small Family Heart is approximately 0.57 x 0.53 x 0.12 inches (HxWxD) not including loop. Back features an antiqued flower pattern. You Are More Loved Than You Will Ever Know Circle is approximately 0.50 x 0.50 x 0.10 inches (HxWxD). Family hearts are available as Aunt, Big Sister, Lil Sister, Sister, Grandmother, Godmother, Mom, Mother, Niece, Wife, Coach, Best Friend, and I Love You. PLEASE NOTE: Our products are lead safe, but are not intended for children 14 years and younger. Charm size is approx. 0.71 x 0.6 x 0.15 inches (HxWxD) including loop. Bracelet is adjustable from 6.5 to 8 inches. Small Family Heart is approximately 0.57 x 0.53 x 0.12 inches (HxWxD) not including loop. Back features an antiqued flower pattern. You Are More Loved Than You Will Ever Know Circle is approximately 0.50 x 0.50 x 0.10 inches (HxWxD). You Are More Loved Than You Will Ever Know Eternity Circle is symbolic for endless belief in the message that is imprinted around the ring. These are motivational or sentimental messages to the wearer. Makes a great gift! If you have any questions about this product by Delight Jewelry, contact us by completing and submitting the form below. If you are looking for a specif part number, please include it with your message.